“Where are all the old white guys,” I blurted out, accidentally voicing what I was thinking. Everybody in the room looked at each other and grew quiet. It was a terrible question. Terrible because it was true. This past week, I was facilitating a Diversity and Inclusion training for a major corporation in a major market. Out of the hundreds of people at the location, only 15 had signed up. Of those, 6 showed up. Everybody in attendance was a person of color, and predominantly female. They were the same people who hold positions of leadership in employee resource groups, who show up to all of the Diversity activities, to all the trainings, to all the conversations. So where were all the old white dudes? The young white dudes? The leaders? Where was everybody else? This is a company with a Declared Commitment to Inclusion which probably has phrasing like “We value all people” and “We believe that our differences make us stronger” and “Diversity is at the heart of who we are!” When people of authority don’t come to the Diversity and Inclusion training, there is something amiss in this ‘commitment’ to inclusion. Platitudes without action are about as effective as thinking about exercise: Good intentions, but you’re not getting your steps in. Said another way: If you are in a leadership position at your company, and you don’t attend training on diversity and inclusion, you are sending a mixed message on how the company prioritizes diversity: It’s a really important bullet point on your vision statement but not important enough to warrant some time on your calendar. I’d go even farther to say that if you don’t go to your D&I training, you are complicit in the subtle behaviors of bias & exclusion. You are sending the message “I have nothing to contribute” or, worse yet, “I don’t care: This doesn’t affect me.” You are sending this message to the people who look to you for leadership. Of course, not all leaders are Old White Guys, but there seems to be a substantial intersection of leaders who are a.) White Guys b.) 40 plus and c.) Deathly allergic to Diversity & Inclusion Training. There’s no easy way to lure busy people of any stripe to take time for training, especially when it doesn’t have an immediate and easy applicability. It’s hard to see how Diversity and Inclusion is more important that the Fire Du Jour that threatens the bottom-line. Fortunately, organizations are beginning to realize that impacting Diversity and Inclusion make the company more adaptable and successful. It’s a slow awakening, like drowsy teenagers on a Saturday morning. Even then, there is a lag between knowing it’s important and understanding that it’s important enough for an individual to show up to learn more. Stop having Open Enrollment Diversity & Inclusion training. Stop it. To make it ‘optional’ undermines your Commitment to Diversity and Inclusion. What if CPR was optional for medics? If diversity is at the core of who you are, show it. Put your money where your Commitment Statement is and require all people in leadership positions to attend. Turn attendance into a Pyramid Scheme. Client business will always come up at the last minute. Minimize it by letting your clients’ know that you’ll be taking a morning to learn more about Diversity & Inclusion. Enroll them in the importance of it. Don’t spring this on them, but spread the word months in advance. Remind them a week before. Change your autoreply while you’re in the session: “Thank you for your message! I am currently in a Diversity and Inclusion workshop. I’ll get back to you after 12:30 today.” Not only can this create a clearing so that participants can be present in the session, you’ve also shown your clients that you’re serious about your commitment to inclusion. Now – provide these questions to your leaders to prepare THEM to encourage their teams to attend. Do people at your company have the “I took a bias training back in 2008, I’m woke!” attitude? Do they look at Inclusion as a checkbox conversation? Do people say things like, “Hey, I read some James Baldwin last year, I’m good for 10 years. Like a tetanus booster shot!” Help people understand that understanding Inclusion isn’t like learning basic Excel. It’s less of a destination and more like a horizon. We can do the work to approach understanding, but we always have farther to go. The mix of diversity in the workplace will change and change again, the company culture will shift, and there will always be more to learn. Finally, remind the Old White Guys that they have a role in these sessions. Their perspective is integral. Of course, so is their understanding, which won’t progress unless they put themselves into new and sometimes uncomfortable conversations. Help them understand that they have a role to play. Because the conversation about inclusion can’t evolve to one of belonging as long as the old white guys don’t feel that they belong. Andy Eninger is a writer, director and performer based in Los Angeles . 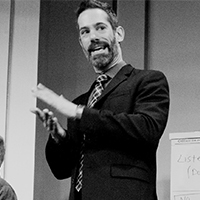 For Second City Works, he designs and leads learning programs for Fortune 500 clients. 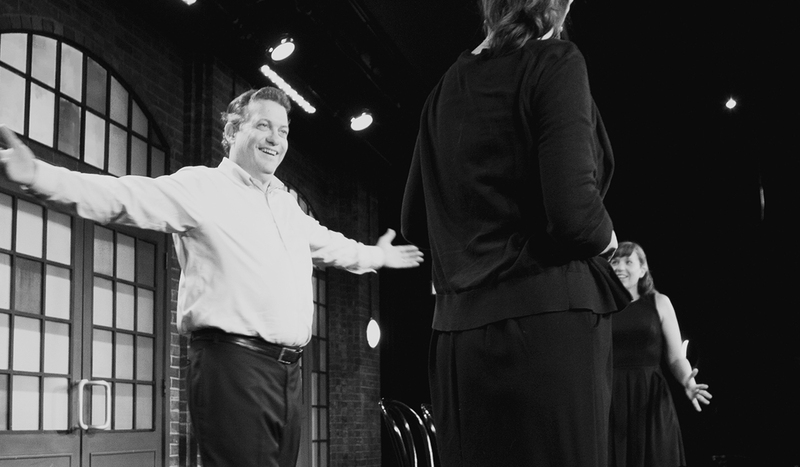 He was the head of Second City’s Writing Program from 2011 to 2016.